This blue nano has been refreshed back to factory defaults. It has some small damage, but doesn't impact usage. The redesigned, ultraportable iPod nano now has a larger, 2.5-inch Multi-Touch display. Play your favorite songs, browse music by genre, or listen to Genius playlists and FM radio. Or watch movies and widescreen videos on the bigger screen. 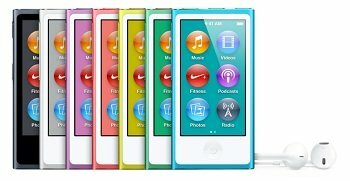 A perfect workout partner, iPod nano tracks your steps, your runs, and burned calories and syncs to the Nike website to challenge friends. And with built-in Bluetooth technology, you can wirelessly connect to speakers, headphones, or car stereos. 1. GB = 1 billion bytes; actual formatted capacity less. 2. Rechargeable batteries have a limited number of charge cycles and may eventually need to be replaced. Battery life and number of charge cycles vary by use and settings. See www.apple.com/batteries for more information.